We cannot finish this new album without your support, and listed below are the various ways you can join the cause. Become an Undie, and together we will have Travelling Show, our best record yet, in cellophane for October of this year. Read on! Especially if you know that we will not need to ship your package to you. Regardless, mailing us a cheque, or sending a transfer by email (corin@theundesirables.com), will work best. It's worth noting, also, that PayPal accepts all currencies. pps. When we hit $10,000.00 we will make a digital download of Singing Bones (never before recorded) available to you all. We can't wait for you to hear it. Thank you friends, and read on!! For $12.50 we'll send you the album, unadorned. Your $12.50 for our music. In your iPod. Switchy switchy. For $25 we'll send you a signed copy of the disc itself. Whether our signatures and inscribed message to you will hurt the re-sale value, only time will tell. That you will have helped us make our best record yet, that we can guarantee. For $50 we will send you the signed CD, as described above, and, for your doubled-commitment to the cause, you choose 1 option from the list below to go with it. You give us $50, we give you the album, plus some good shwag. How about it? Tradsies? (c) Undie Pack: A limited-edition signed poster, a sticker, a fridge magnet, pin, and beer-cozy (in Australia they call them stubby-holders, and they are so right-- 'beer cozy' sounds like you're drinking with your grandmother-- not that I'm opposed to that). For $100 we would do a lot of things you wouldn't brag about in church, but that's not what we're talking about here. In this case, for $100 we will send you a signed CD, and to go along with it you'll be granted three choices from the list below. This one's like your own private Undesirables Genie. Make it three shirts, three tickets, or any combination that pleases. It's your lantern, rub it any way you like. Which reminds me of those other things we would do for a $100. Just not here. $250.00 Stop Fighting It: Become An Undie! Your name will be included in the liner notes of the CD package. At this point you are making the record with us, and have officially joined our Order. You are now an UNDIE. It's a dubious distinction at best-- it may even do harm to your reputation... but though we may walk under a hail of derision, down a gauntlet of hisses and jeers, we will walk together, as Undies. Wherever you go, you'll have us on your side. You'll be in bad shape and good company, and that's not such a terrible way to travel. 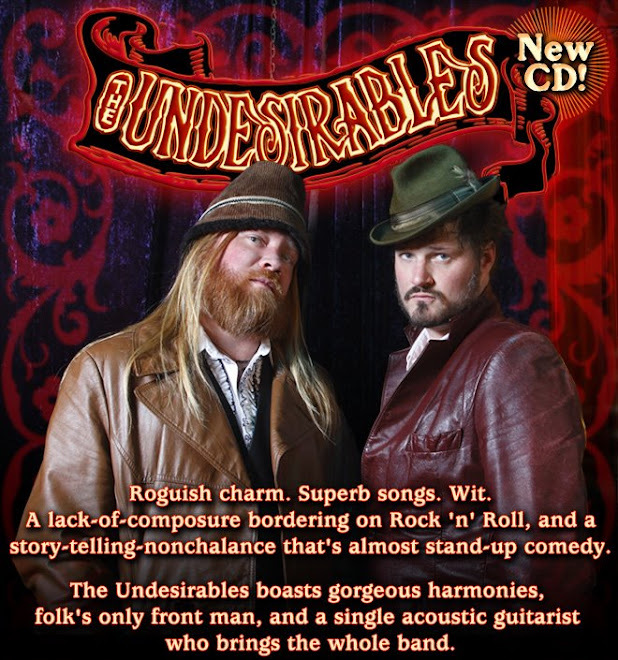 The Undesirables will perform a House Concert in your home. You are encouraged to sell tickets, by which you can earn your money back, but the concert is paid for. One of the sweet things about this particular patronage is that it is the only one with which you can recoup what you have donated. Howzabout that? House Concerts are THE most magical way to experience music. They are becoming more popular than they've ever been, they're an incredible community event, a great party, and in this case, the celebration would be for a landmark album that you have Executive-Produced (you will receive an Executive Producer credit in the liner notes of the album for this one. We're entering serious patronage territory now). We will write an Undesirables song to suit whatever subject or occasion you choose (anniversary, birthday, a piece of personal history, your vocation, etc.). We will perform the song at your house concert and provide you with a studio recording for your own purposes. Are you serious? Or you just scrollin'? You even readin' this one??? 3) Two lifetime V.I.P. passes to any Undesirables appearances anywhere. 4) A signed, One-Of-A-Kind Undesirables guitar. Weathered and beaten by hundreds of shows and thousands of miles. There are two Limited Edition Lifetime Undie Packages, and two guitars, available. They are a Jasmine (Takamine) and a Guild (True American). Songs like Singing Bones, Traveling Show, Alex Warner Revisited (all on the new album), along with California Wine, Fill Me Up With Sound, Down and Out, Look Out Jack, Sinking Into Sleep, Dancing On The Faultline, and Round Trip Love Song, were all written on the Jasmine. The Guild, on the other hand, was the guitar with which we produced If I Send For You, Up Above The Clouds, Night Train (all on the new album), Asking Me To Give You The Blues, The Dog You Forgot To Let In, This Town, Bus Stop Walk, 90 Days, Sandy Side of the Moon, The Butcher Song, and Summer's Gone. Sean Cotton played these guitars to death but the ghosts they contain are top drawer. 5) One signed, framed photo of the guitar in action, from The Undesirables' archives. If you give The Undesirables $10,000, we're yours for life. You will have our fealty till the end of the line. Wherever we go, and whatever we achieve, you will be in the fabric of The Undesirables' story, and of our success. The more we are able to raise, the freer we are to do the work we're here to do, which is to write the best songs, and to make the best albums, of our career. This is our time. We've still got something to show the world which they haven't seen yet, and donations at this end of the scale are going to set us free to do it. Of course, every contribution helps, and, if I may quote John Prine, 'a lot of little will do'. If I may quote Corin Raymond, 'where there's a will there's a wallet'. At least that's what we're hoping. Here`s where you can find out how the campaign is going! Make an 'Undies Foundation Donation' and receive our Undying Undie love!! Buy our CDs from cdBaby.com! Become Our Fan on REVERBNATION!